Description: Welcome to 134 hilltop drive. 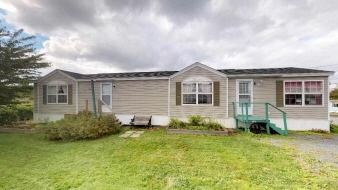 This attractive 2 bedroom mini-home is conveniently located in a pet friendly park. The home is spacious and bright, featuring an eat-in kitchen with loads of natural light. Two sets of pocket doors between the living room & kitchen, as well as the living room & sleeping area give you the option to separate these areas or leave things open. There is a large 4 pc bath with a cheater door from the master. The home is carpet free and there is plenty of closet space, comfortable living for years to come!